Oldman take a poop at my life. I’m a pot like you were. Reserved only for Gary ? ♫ Oldman! 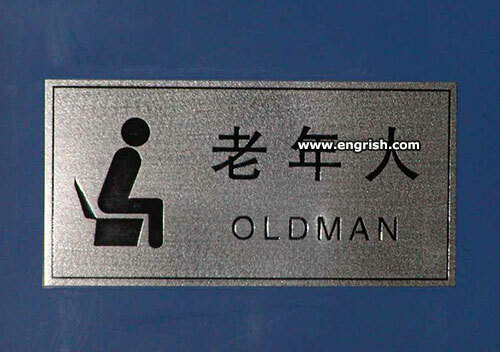 Can you sit on the loo, I said oldman! Can you do a good poo. I bet Paul Newman would have wanted his own crapper as well. How does one levitate, a couple of inches above the seat? Uhh. I thought it got more urgent, as one got older. He is an oldman because he did not go to the deformed man end place. @Marum | 10:05 am: The power of the beans and onions diet. It occurs to me that this may not be a sign for a toilet, but for a waiting area or something. Which would make it even funnier! So you younguns can use the facilities on the upper floor! This should be placed on men’s rooms all over Brooklyn, NYC. Although in English the slang for an old man is “Old Fart”, in Yiddish the equivalent slang is “Alter Kahker”…an “Old Crapper”!